The Star Breeze. Photo courtesy Windstar Cruises. Can you guess what I have in common with the Queen of England, Sophia Loren, the Rockettes, and Tinkerbell (besides two X chromosomes)? We’re all godmothers of ships. I’m honored and flattered that Windstar Cruises has named me the godmother of its newest ship, the Star Breeze. I’ll be christening the 212-passenger vessel on May 6 in Nice, France. Yes, that means I’ll get to smash the champagne bottle against the boat’s bow—a 4,000-year-old tradition (although the Vikings sprayed blood over the bow)—and host glittery parties on the inaugural voyage. We’ll be sailing to Rome, with stops in the picture-postcard ports of Monte Carlo, Portofino, and Portoferraio, on the island of Elba. While I’ve sailed on Windstar before as a guest lecturer, this will be my first time back onboard since I had children. And I cannot wait to return to the small, romantic, sophisticated ships of my pre-kids life! Some of the most rewarding and authentic travel experiences I’ve had have been on Windstar voyages. That’s because they enable you to see collections of islands and stretches of coastline that would be too logistically difficult, time-consuming, and expensive to see any other way: The ships are small enough to sail into the tiny picturesque harbors and hidden coves that big ships can’t access. As an example, my first Windstar voyage was in the Caribbean, and each day we stopped at a different off-the-beaten-path island—such as Bequia, Ile des Saintes, Jost Van Dyke, and Virgin Gorda. They’re the sorts of tiny islands where you can get off the ship and just meander off on your own and meet and talk to the locals. That’s hard to do on big cruise ships because the larger the ship, the more industrial and overbuilt the ports, the more time it takes to get on and off the ship, and the harder it is to escape the cruise crowds. I took my dad on that Windstar Caribbean trip, and what we loved most were the idyllic views as we sailed into port each morning and out again each evening. My dad also loved how the bartender remembered his name and favorite drink from Day One. I was scheduled to be a guest lecturer on Windstar again right after I got married, so I took my husband, Tim, and it morphed into our honeymoon—the first of several (honeymoons, that is; not husbands). The cruise was from Athens to Monte Carlo, with stops in jewels such as Monemvasia, Greece; Taormina, Sicily; Capri, Italy; Bastia, Corsica; Portoferraio, Elba; Portofino, Italy; and St. Tropez, France. We had the same perspicacious bartender, Danny (yes, we remember his name too). The day I recall most vividly—because it was the most perfect day of any cruise I’ve ever taken—was when we stopped in Fiskardo, a sweet fishing village on the Greek island of Kefalonia. Tim and I rented a car to explore the island. Our first stop was Myrtos Beach—a dazzling white arc of sand book-ended by dramatic cliffs and water in a dozen shades of blue. We were the only people there. After a swim and a couple of fun drives up and down the steep winding road with hairpin turns that leads to and from the beach, with Tim trying to teach me how to drive a stick (rental cars and zig-zag roads are good for that), we continued on and stopped at a seaside taverna for lunch. Again, we were the only people there—and it was the freshest calamari and Greek salad we’d ever tasted. On we went, passing a farm with a “honey for sale” sign. We stopped to buy some homemade honey and ended up spending an hour talking with the beekeeper and his daughter in their house and getting a tour of his traditional rural apiary. We continued criss-crossing the island, at each turn seeing views more glorious than the last. By the time the sun was setting, we were back onboard the ship in the hot tub, daiquiris in hand, watching our favorite new Greek island recede into the distance as we sailed to the next day’s adventure. Back then never in my wildest dreams would I have thought that someday I might serve as the godmother of a Windstar ship. The inaugural sailing is sold out, but I’ll be hosting another Windstar voyage this summer—as well as lecturing onboard—and I’d love for you to join me! Details to come. 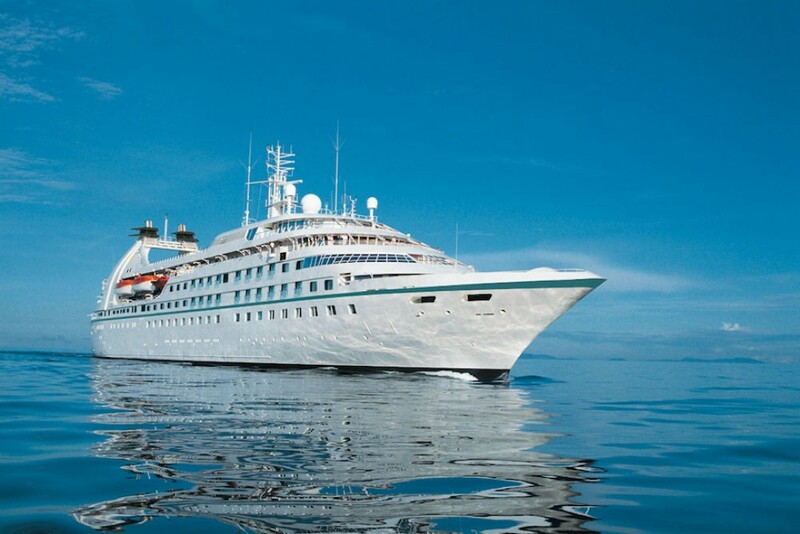 Have you sailed on Windstar? I’d love to hear about your experience. Blessings to you Wendy – what a wonderful honor – godmother of such a beautiful ship. I had my first MAGICAL cruise with Windstar this past January. We stopped in several of the Caribbean islands you mentioned. Looking forward to visiting some of the Italian and Greek Ports that you have recommended – especially MYRTOS BEACH on Kefalonia. No Big Ships for us again. Thanks for sharing your wonderful story Wendy. All the best to you. Sounds exciting. My sweetheart and I are looking forward to the Star Breeze cruise in September. It’ll be my 1st cruise and your words have me counting the days and weeks already. Save some champagne for me will ya!! Dear Wendy,congratulations on this honor . We have sailed 6 times with Windstar and the first time was because of your high praise for them.We have not sailed with anyone else since so we thank YOU for exposing us to this wonderful line. Too bad the inaugural voyage is sold out;would have loved to have met you.Enjoy it! Wendy – all the baby boomers from http://www.babyboomergold.com and from our Facebook page share in the enthusiasm over your honor and wish you the very best when blessing the Star Breeze! Hi Wendy! My wife and I enjoyed our first Windstar cruise this past December. What an experience! We read your wonderful worlds of island exploration and felt as if we had been on the same cruise. Having been on many “big ship” cruises we now will be small ship cruisers. We love our Caribbean cruise so much and are now planning on expanding our trips to the far corners of the world. I wish we could be on your “Godmother” cruise. Enjoy and let us all know how your cruise was. Congratulations, Wendy! This will be an auspicious beginning for your new godchild! Congratulations, Wendy, on being a godmother of a ship! We really enjoyed this article as smaller ships and tiny islands appeal to us. Being able to get away from the cruise crowd and talk to the locals sounds delightful!